This entry was posted in Uncategorized by Thomas Bachand. Bookmark the permalink. That’s interesting that this photo took your breath away. I don’t see any emotion at all in it. 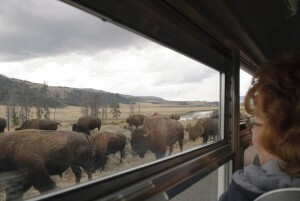 However, I don’t know the history of bison in the Lamar Valley. I do love the overcast sky, and the way the window frames the bison and sky, with a strip of trees on the horizon to split the image.